While the weather outside is cooling down, take a look at an artist born in November whose work is known for bright colors, exuberant patterns, and play on texture and form. Miriam Schapiro has dedicated her life and career to bringing women artists to prominence in art and academia. Miriam Schapiro, born November 15, 1923, is a painter, sculptor, teacher, writer, and self-defined “femmagist.” She is often cited alongside Judy Chicago as a founder of the Feminist Art Program at the California Institute of the Arts. In 1972 the two artists co-created Womanhouse with twenty-one art students—this landmark collaborative art project explored feminist concerns about women’s place in the professional and art worlds. The transformation of a Hollywood house, previously scheduled to be demolished, allowed the artists to make traditionally female spaces, such as kitchens, into feminist works of art. As her career progressed, Schapiro became interested in art and techniques that had been considered “female” or women’s work. These techniques included quilting and embroidery, and have often been ignored in canonical “high” art. Schapiro invented the term “femmage” to explain her process for creating art, in which she began to combine painting, textiles, and paper into collages. She transformed the collage, first brought into the realm of canonical art by male heavyweights Picasso and Braque, into a feminine exploration of pattern and texture, coupled with traditional artisanal elements such as lace, fabric, and needlework. Through this work, she calls for techniques once deemed mere “craft” to be brought into the realm of fine art. Her brightly colorful and busy compositions ushered in a new art form at a time when the art world and market was focused on Minimalist and Conceptual art. The National Museum of Women in the Arts owns one such work, created in 1979. Mechano/Flower Fan draws upon the fan as an item traditionally created by, and used by, women. Schapiro’s bright colors and geometric planes, created from fields of paint and collaged fabric, refer to artists such as Picasso, who used the collage to explore symbols and the creation of signs in culture. 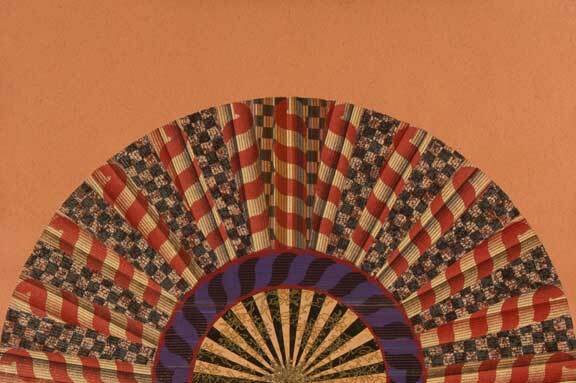 With this history in mind, Schapiro argues against the fan as a traditional symbol of shy, demure women. Schapiro’s legacy and artworks continue to inspire other artists. Her groundbreaking inclusion of items such as textiles in painted works advanced the realm of “craft” to a new, true art form.